Snapchat is the latest hot US startup to hit the headlines. Late last year, the brand made the news for turning down a reputed $3 billion offer from Facebook. Since then, the company has been talking about its plans and how businesses and brands can tap into its audience. So does it offer real potential for brands? Who uses it? To recap for those new to the phenomenon, Snapchat is a picture and video-based messaging system allowing people to take ‘Snaps’ and send them to their friends (with the ability to scrawl notes over them). These don’t last forever; the sender specifies a duration at which point the image or video is deleted. 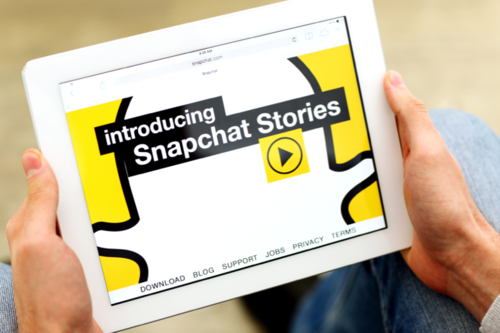 A more recent development is Snapchat Stories, which lets users build items of shared content. Stories last for 24 hours and can be viewed multiple times. The aim is to create a timeline of content. Stories also make the service more appealing for advertisers. There’s no published data on the audience size but it’s dominated by US consumers who account for 65% of users. The service is also popular in Europe, especially in the UK, France and The Netherlands. It isn’t for all brands. Alcohol brands should probably avoid it as there’s no age-gating (at this stage). Alcohol campaigns risk the charge of appealing to under 18s as the percentage of under-age drinkers is above recommended levels (Portman’s digital guidelines suggest avoiding associations where more than 25% of the audience is under 18). For brands with an older audience the reverse is true – the risk is very low usage or high investment in driving fans to Snapchat (Does it appeal to over 30s?). For fashion, gaming, entertainment and travel brands, Snapchat has massive potential. Retailers can also reach and engage with a young audience. Time-limited offers, snaps showing new lines, gaming previews and more can be promoted via Snapchat. The best news? At the moment there are no costs for using Snapchat Stories, as the company seeks to build commercial case studies. They’re also happy to talk to and advise brands on their ideas to help businesses testing the channel. For many brands targeting the mobile generation, Snapchat is a key channel to consider.